touches of sense...: Where are you from? I am never quite sure how to respond to this question. What does the person really want to know (if anything)? "Do you want to know where I was born?" "Well, I was born in Blackpool." "Do you want to know where I live?" "Do you want to know where I lived?" "Do you want to know where I work?" "Do you want to know with which place(s) I identify?" "Well, I am from Clermont Ferrand." This was an answer I gave to a man in a queue at the checkout of a hypermarket in France. My answer clearly did not satisfy him. "Oh, you're not really from here," he says with spite, "You're a plum (pudding)." I have lived in this town for 30 years - longer than anywhere else in my life. "I am from Clermont Ferrand." They immediately detect that I am "from somewhere else". "But you're not really French." "I can hear a little accent." The fact that I have French nationality means nothing to them. I will never be "really French." "Well no in terms of passports, I'm British and French." "Oh...but you're not really French." 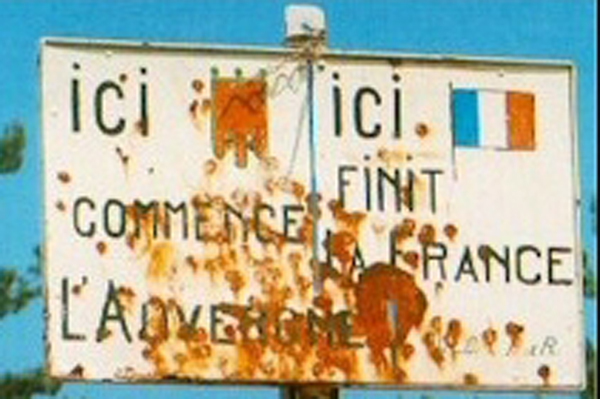 The Auvergne, the region in which Clermont Ferrand is located, is not really France...to some. Alsace and Lorraine, a border territory between France and Germany, has alternately been "French" and "German". Wars have been fought so that they can say it is "français" or "deutsch". It is for now "French". Who decides what it is to be French? Who decides what it is to be Auvergnat? Who decides what it is to be English, British? What do I answer when I am aware of my heritage with its English, Scottish, Irish, Dutch, and Norman origins? On what criteria shall I be judged "really English"? I chat with one of my friends from university that I have known for thirty years. "You're not really English now are you?" he says in a broad Derbyshire accent, "You're more French than English." As a child, I lived in a big house, a rectory, as my father was a clergyman. When I played in the park and spoke to the other kids, it was clear that I was unlike them. They gave me dirty looks and chattered between themselves. I never had a local accent like theirs. I never sounded like I was from any place in particular. I remember being able to detect the accent from a small town near Preston in Lancashire. "That person's from Bamber Bridge," I rightly guessed. Nobody easily detected where I was from. I didn't come from a place, I came from a class. I was marked as "posh" by some. I spoke, like many middle class kids, a version of "received prononunciation"
I alternate vowel sounds from the North West and from received pronunciation. I am not quite one thing or another. I am not a real anything really. I am a human...I suppose. Talking with a British colleague in France, I immediately determine that he, like me, has been to boarding school, to public school. "I am from a class, I am from public school." Where he or I are from is an irrelevance. Suspect origins, suspect sexuality, suspect intentions. So, I am in a pub with my family in Yorkshire. As we come in, the local people all stop speaking and stare. I am reminded of a scene from American Werewolf in London. An American Werewolf In London - The Pub Scene from Sajeev cheeroth on Vimeo. I forget the norms of masculinity in Yorkshire, I have, like many French men, a shoulder bag. "Oh, look he's got a handbag." jeers one of the "real" men at the bar. How could I have forgotten that having a shoulder bag would make my sexuality appear ambiguous? I run through the possible answers in my head. "I was born in Blackpool." "I lived for many years in Manchester." "I identify with the North West of England, Lancashire." "I am from Clermont Ferrand, in France." "I was born in Blackpool, but now I live in France." The men in the bar appear not to be able to get their heads around that. "Can I buy you a drink." one offers. I do a quick mental calculation of the number of rounds I will be up for and politely decline. I am rejecting their challenge, their "hospitality," to be mascot, a token, a guest member of their drinking fraternity. They go back to speaking about football. If I am writing of this now, it is because I am currently studying on a course which concerns intercultural facilitated virtual exchanges. "Don't ask me where I am from, ask me where I am local." I decided to annotate the video and tweet it out on Twitter. I choose a number of friends whose reactions to the video intrigue me. These people, I know, have lived in a number of different countries, are living in colonised lands or are more rooted, and identify with a land, a national group. I wonder how occupation by invaders or colonisers of a territory affects the strength of people's association with populist concepts of "nationality". In times of mass migration or military invasion, I wonder about "resistance" to "diversity." What would a coloniser answer to this? "Why don't we just all go back to where we came from?" "We're not from here are we?" How do the colonised feel? Do indigenous people identify with national myths, national concepts? How many generations does it take for people to feel a sense of a place being "home". I think of people in Corsica, in Majorca and other "desirable" territories for "second homes" who are being priced out of the market by wealthy investors who buy up property and let it out on Air B'n'B, ripping out the heart of communities. What to say of how attachment to land, to culture, to home is being wrenched from families? I get some more reponses to my tweet. I am a local of the Cabrini-Green public housing area on the Near North side of Chicago, of my basement office in front of a PC, of many places where I spent one, two or three or more years over a 71 year lifetime. I'm gonna come back to the vialogue. But I was in a situation today where someone said it was "so exciting" when they learned I was in Egypt and it felt exoticizing, like I didn't belong... And man, it was in my own home of vconnecting! I think of connection in a time of disconnection. I wonder who really benefits from Erasmus "Intercultural", "Virtual Exchanges" ? Indeed, whose interests does "European Union" really serve? I wonder to whose and what ends academia and its markets are performed? I am ever so proud of having seeded a lawn. I never get round to growing food. I pick up fruit and vegetables in the hypermarket. "Corsica, Spain, California, South Africa, China, Guyana, Kenya..."
I look at labels on my clothes. Where they are from is an irrelevance. I look at the price. I don't care about the cost to others. I am detached from the people, the children perhaps, whose calloused hands made my t shirt. The t shirt and I are from a system, an exploitative system. I wonder to what extent our local attachments, our feelings of belonging are under threat. "Where is your/our wealth from?" A well woven cloth of a post Simon!